When that expensive new paving was first laid it looked impressive. But now the ravages of time have taken their toll and today it looks grey and dirty. The moss, lichen and the weeds are taking hold retaining dampness that will cause cracking and erosion. It's not just the appearance: the surface can be become slippery and potentially dangerous. 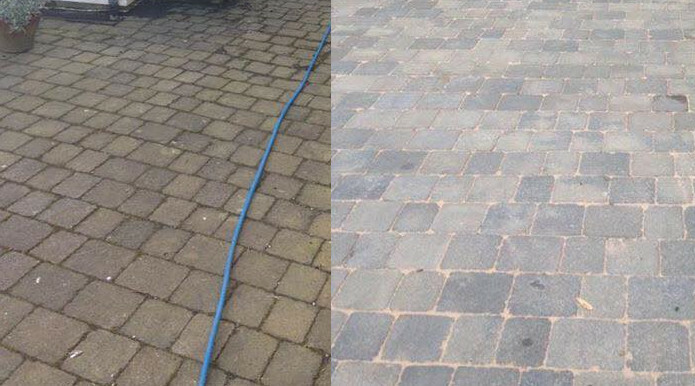 Our professional pressure washing service will restore your driveway, patio, paths - even decking - to an as-new condition. Don't take our word for it; look at the before and after pictures below and on the Portfolio page. Refurbishing a patio to "as new" in Alderley Edge. 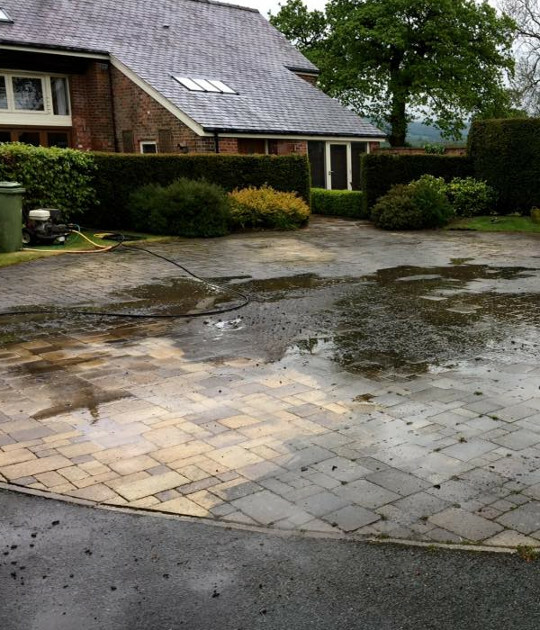 We will restore your block paved, tarmac, flag stones, slabs or concrete drive, driveway, paths or patio to look like new by pressure washing. A dirty driveway, path or patio affects the overall look of your home - and indeed its value. For a fraction of the cost of re-paving we can transform the appearance of your home. We do not use any corrosive chemicals; just mains water. We provide a satisfaction guaranteed driveway cleaning service, plus re-sanding and sealing if required. 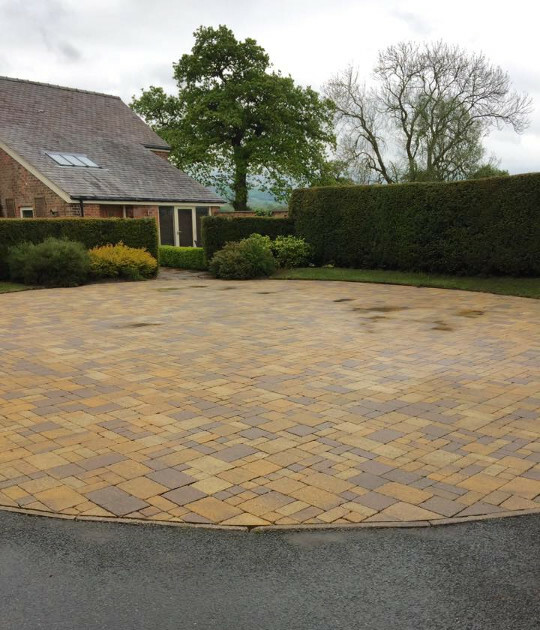 Block paving on driveways and patios are prone to loss of colour, growth in the joints, and on the surface. This is due to the porous nature of the block paving and the stabilising sand within the joints. 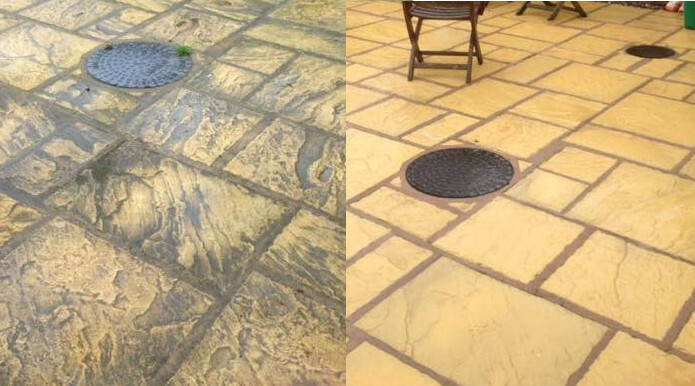 Our specialist cleaning equipment will remove moss, dirt, algae, weeds and most stains. As approved installers of superior paving sealants, once dry we can then treat the surface with block paving sealer which will keep it looking good for years to come.